I was greatly interested to pick up the current issue of the Walrus upon discovering it contained a memoir by David Gilmour, "My Life with Tolstoy," with a focus on War and Peace. I do have to question how close Gilmour really is to W&P, though, when he describes it as starting in Anna Pavlovna's luxurious Moscow apartments — it starts in Petersburg. I was delighted to note a web "extra" regarding translations, but it's so spare as to be utterly pointless. He mentions the "good" ones but provides no reasoning for his judgement — Garnett is his favourite, but from the print article I can only believe it's for sentimental reasons. He mentions neither Dunnigan (which I'm reading) nor Briggs (the general buzz about which makes its oversight glaring). It's improbable that he's read more than the Garnett in its entirety and he is likely basing his judgement on generally held opinions and a random sampling of passages. To be fair, that's how most of choose which translation to read, but as an extra to a mostly engaging article in a reputable publication, this sidebar is a missed opportunity. Gilmour also makes a snide aside: "how anyone over the age of twenty-five can prefer Dostoevsky to Tolstoy is a mystery to me, rather like fancying the Rolling Stones over the Beatles." Well, I'd always thought I preferred Dostoevsky, but then I was well under 25 when I came down on that side, having read only a few works by each. Perhaps when I finish W&P I'll reassess my stance. There might be something to it, typing people by dichotomies — Tolstoy/Dostoevsky, cats/dogs, chocolate/vanilla; more apt than Gilmour's pairing by which to identify camps might be Lennon/McCartney (butI won't say which way I think they align). Within the print article, Gilmour calls it a dull section where Pierre joins the Freemasons, and I didn't find it so. So. Let each reader's experience of it be their own. I made the mistake of reading the introduction to my Dunnigan edition. I immediately wished I hadn't as it contained spoilers regarding who was coupled with whom. But a couple hundred pages in, none of them had come to pass, and some even seemed contraindicated. I dare not reread the introduction for clarification at this stage. The "spoilers" in Gilmour's essay further contradicted both what I'd read and what I'd been lead to expect by other sources. So it's almost like not having read any spoilers at all. So where to start? It's just so big — not just the page count; the whole thing sprawls interesting characters, pithy observations, deeply soulful descriptions, moral and spiritual questions, and millions of associations. I've dogeared almost every other page to note something Important, which has had the same effect as having taken particular note of nothing at all. The book begins for me on p 377. That is, really begins — this is where I realize there's more going on than soirées and troop movements. Prince Andrei is wounded (B1, P3, ch17). He opened his eyes, hoping to see how the struggle between the gunner and the Frenchman ended; he wanted to know whether the red-haired artilleryman had been killed or not, and whether the cannons had been captured or saved. But he saw nothing. Above him there was nothing but the sky, the lofty heavens, not clear, yet immeasurably lofty, with gray clouds slowly drifting across them. "How quiet, solemn, and serene, not at all as it was when I was running," thought Prince Andrei, "not like our running, shouting, fighting; not like the gunner and the Frenchman with their distraught, infuriated faces, struggling for the rod; how differently do those clouds float over the lofty infinite heavens! How is it I did not see this sky before? How happy I am to have discovered it at last! Yes! All is vanity, all is delusion, except those infinite heavens. There is nothing but that. And even that does not exist; there is nothing but stillness, peace. Thank God..."
This scene is often cited as being one of the most memorable in W&P. I held my breath for the next few chapters; I shifted with Andrei, in and out of consciousness, between reality and something else. He is before Napoleon, "such a small, insignificant creature compared with what was taking place between his soul and that lofty, infinite sky with the clouds sailing over it." This bit still puzzles me: What did he see? What did it inspire in him? Not God. He's ill for some time. When he returns, his wife dies with a reproachful look on her face. For 2 or 3 years it seems Andrei is merely going through the motions; he's in a depressive state. Is he mourning (the wife he thought stupid)? Is it posttraumatic stress disorder? Somehow that clarity, that sense of what it all means, translates into inaction, the pointlessness of everything? Russian fatalism? All that is left for him is his son, he thinks, and this does not seem much to him. There's the oak tree; we pass by it a few times. I love the oak sequences better than the lofty heavens. A whole new sequence of thoughts, hopeless but ruefully satisfying, rose in Prince Andrei's soul in connection with that oak tree. He considered his life afresh as it were and arrived at the same hopeless but soothing conclusion as before, that it was not for him to begin anything anew, but that he must live out his life harming no one, disturbed by nothing, desiring nothing. So Pierre doesn't believe in God. He meets a Freemason. He starts reading Thomas a Kempis, sent to him anonymously. One thing, and one thing only, he realized as he read this book: the hitherto unknown joy of believing in the possibility of attaining perfection, and the possibility of an active brotherly love among men. And about a week later, just like that, Pierre believes in God (p 432). Or he says he does when asked. He actually thinks about it and hesitates before answering, then very quickly reaffirms his position. Is this genuine? A sudden realization? Or does he give this response to gain access to the Brotherhood, for all the other benefits and social good he believes in? Is he fooling himself, or others? "At this meeting Pierre for the first time was struck by the endless variety of men's minds, which prevents a truth from ever appearing the same to any two persons." And he sinks into a depression (p 529). It was all the same to him: nothing in life seemed to be a matter of great consequence, and under the influence of the depression that possessed him, he valued neither his liberty nor his determination to punish his wife. What strikes me as evident particularly in Andrei and Pierre, but also Nikolai, is a swaying between extremes. From "Life is meaningless" to "life is full of purpose" and back again, and again, in 60 seconds. Is this a Russian characteristic? Is this part of Russian fatalism? What is Russian fatalism anyway? Nietzsche said "Against it the invalid has only one great remedy — I call it Russian fatalism, that fatalism without revolt with which the Russian soldier, when a campaign becomes too strenuous, finally lies down in the snow. No longer to accept anything at all, to take anything, to take anything in — to cease reacting altogether." That phrase — "Russian fatalism" — is usually considered gloomy, depressing, pessimistic. Is it? All this back and forthing has me thinking about Pythagorean dualism or a dualism of contraries (a subject I don't know a whole lot about, but read some stuff on many, many years ago). Aside from swaying between meaning and meaninglessness, Tolstoy sways also between (obviously) war and peace, big picture and small details, masculine and feminine (on p517 he refers to "the feminine world, society"). From Dictionary of the History of Ideas: "The Pythagoreans taught that all things are composed of contraries: the one and the many, the limited and the unlimited, the odd and the even, right and left, masculine and feminine, rest and motion, the straight line and the curve, light and darkness, good and evil, etc." I'm not sure what to make of this. My understanding is that Pythagoras blended mathematical principles with the mystical, and it's also my understanding that Tolstoy tries to apply a mathematical calculus to History, and I find this kind of exercise interesting. Tolstoy said "Neitzsche was stupid and abnormal." In trying to find out a little about this thing called Russian fatalism, I came upon some quotes by Nietzsche, on women, war, truth, etc, and was astounded by how well suited many of them are to summing up the attitudes expressed in War and Peace. I'll probably look into this a bit further myself, but thought I'd ask if anyone knows anything more about their relationship or how their ideas relate. He surprised me by asking whether I remembered the threefold aim of the order: (1) The preservation and study of the mystery. (2) The purification and reformation of oneself for its reception, and (3) The improvement of the human race by striving for such purification. Which is the principal aim of these three? Certainly self-reformation and self-purification. Only to this aim can we always strive independently of circumstances. But at the same time just this aim demands the greatest efforts of us; and so, led astray by pride, losing sight of this aim, we occupy ourselves either with the mystery which in our impurity we are unworthy to receive, or seek the reformation of the human race while ourselves setting an example of baseness and profligacy. There's some references to the dreamlike quality of things (by Pierre, primarily, I thought, but can't find references now). I think Andrei's lofty sky counts. Also, meeting Speransky, then seeing him in a new light, as if for what he really is — somehow separating the essence from the actions, the superficial representation. And Natasha at the opera. These scenes feel like I'm watching a movie stoned, the difference between thinking in analog and digital. Look up my notes on Dostoyevsky — what story?, that dream sequence — why do I think of it now? Is there something Platonic in all this? Again, Natasha at the opera is in stark contrast to the other musical moments. She is not technically perfect but sings with "soul," charms everyone. Also, at Uncle's house after the hunt — this is my favourite and the most enchanting episode thus far. As you may recall, earlier this summer I bought some art from a cigarette machine. Well, after a few weeks, I felt a little niggling, an urge; so I set forth to search out one of the other machines in the city. I found one at Le Divan Orange. I popped in my toonie, pressed a button nearly at random, and out came my prize, this time in a real (painted-over) cigarette packet. Only, I couldn't really justify feeding what felt like the stirrings of a compulsion, so I packed it up and sent it to Patricia. See what she got! Yes. The stirrings of a compulsion. Better to call it a "project," no? I need to see all of Montreal's Distroboto machines this summer, and I want to know what's in them. You can help, by relieving me of the burden of guilt for hoarding trash (or art, whatever). 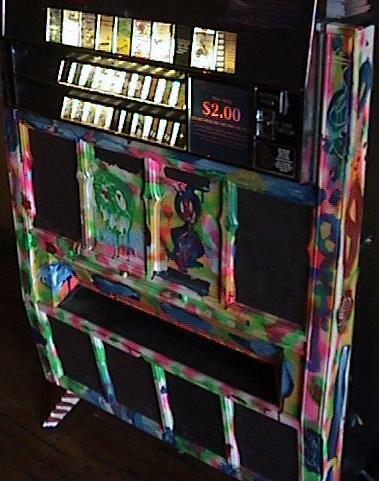 Send me an email with your postal address, and I'll send you a cigarette-machine "art" surprise. (C'mon, you know you want to, Martha.) I can't guarantee what you'll get; I ask only that you blog about it. The Dora fishing rod (Zebco) actually works. I caught 2 fish with it last weekend. It's been a favourite toy of Helena's since she received it at Christmas, but the tedium of the real-life conditions of fishing, after the delight of live bait waned, outweighed her capacity for patience. She fell asleep, hatted and lifejacketed, in a corner of the pontoon, and so did not witness what Dora would yield forth. She'd anticipated our cottage weekend for days, and on arriving she was in nonstop-go-go-go mode to see all the water, trees, fish, frogs, bugs, and loons; we played pirates, marching on and off boats, yo-ho-hoing, stepping inside the cottage only to pillage and plunder her grandmother's grapes. I'd been worried about Helena's reaction to the realization that this was a short trip, less than 24 hours. But after a full afternoon's excietment and a late night, she woke up wanting to go home. So we did. This letter, signed by Jose Saramago, Harold Pinter, Noam Chomsky, and John Berger, appeared July 21 buried in The Independent's letters page. A quick internet search on these authors' names shows the letter to have been printed in (as far as I can tell) Portuguese, Turkish, Spanish, Swedish, and Italian across Europe, Turkey, and South America, with almost no notice of it in English. The latest chapter of the conflict between Israel and Palestine began when Israeli forces abducted two civilians, a doctor and his brother, from Gaza. An incident scarcely reported anywhere, except in the Turkish press. The following day the Palestinians took an Israeli soldier prisoner — and proposed a negotiated exchange against prisoners taken by the Israelis — there are approximately 10,000 in Israeli jails. That this "kidnapping" was considered an outrage, whereas the illegal military occupation of the West Bank and the systematic appropriation of its natural resources — most particularly that of water — by the Israeli Defense (!) Forces is considered a regrettable but realistic fact of life, is typical of the double standards repeatedly employed by the West in face of what has befallen the Palestinians, on the land allotted to them by international agreements, during the last seventy years. Today outrage follows outrage; makeshift missiles cross sophisticated ones. The latter usually find their target situated where the disinherited and crowded poor live, waiting for what was once called Justice. Both categories of missile rip bodies apart horribly — who but field commanders can forget this for a moment? This has to be said loud and clear for the practice, only half declared and often covert, is advancing fast these days, and, in our opinion, it must be unceasingly and eternally recognized for what it is and resisted. The letter has since been endorsed by Tariq Ali, Eduardo Galeano, Naomi Klein, Arundhati Roy, Giuliana Sgrena, and Howard Zinn. On various occasions I have written about "literary madmen," but they are not merely a fixation of mine. I find that reflecting upon outlandish theories that were taken seriously for a long time teaches one to distrust many ideas that are accorded full credence in the media, and even in some scientific circles. Martin Gardner notes that "most mathematicians believe that an inside-out universe, with properly adjusted physical laws, is empirically irrefutable". However, Gardner rejects the concave hollow Earth theory, not as disproven, but instead entirely on the basis of Occam's Razor. Tomorrow is World Jump Day! Science or performance art — you decide. It's claimed that if 600 million people in the Western hemisphere jump simultaneously (11:39:13 GMT, July 20, 2006), Earth will be driven out of its current orbital rotation. "The change of planetary positioning would very likely stop global warming, extend daytime hours and create a more homogeneous climate." There's a spider living in our bathtub. I noticed him about a week ago. There he sits, occasionally runs a lap, minding his own business. Just a regular, non-threatening, garden-variety spider, the kind you find in most people's basements. Though this one looks pretty healthy. About an inch in diameter with legs splayed, his body the size of the tip of my pinky. Then bath night came along. I scooped him up on a magazine and deposited him in the opposite corner of the bathroom. A couple days later he'd made his way down the hall to Helena's room. Oh, the shrieks. She loves pretending to be scared, but perhaps he'd crossed a little far into her comfort zone. This time I transported him to the laundry room. It didn't occur to me at the time that the cat, whose litter box is in the area, might take an interest. As a matter of fact, he didn't — the cat is unbelievably lazy these dog days. By next morning, Spidey had crossed the hall and settled back into the tub. Then it's bath night again; J-F in preparing the bath area must now find a safe haven for the critter. He picks him up, and... drops him. Down the drain. There's nothing to be done about it. The bath must proceed. Water will be evacuated through those pipes. It took a couple nights, but this morning, Spidey's back. Helena wants to build him a house. There's a way you read when you travel; it is, in itself, a kind of transport, the purity with which you pay attention. You never read like that at home. In fact, as the years have gone by and with them a dozen other trips, it has occurred to me that reading, all on its own, may well be the best reason to travel. Share your thoughts on Napoleon while we dissect War and Peace. This novel is turning into quite the history lesson. I'm still exhausted after having spent Wednesday with Helena and her daycare at Wonderland. A 2-hour round trip on a schoolbus with small children, the noise, the cruel sun, the lameness of it all, the difficulty of seeing it through the eyes of a 3-year-old, being generally overwhelmed not by the task of minding one's own child so much as resisting the smothering effect of the collective energy of so many small children on their own territory and the occasional but harsh intrusion of some ill-mannered parents — it was all worth it to see the sparkle in Helena's eyes when she came face to face with the Big Bad Wolf. I'd consciously left the camera at home so I could be there with her. 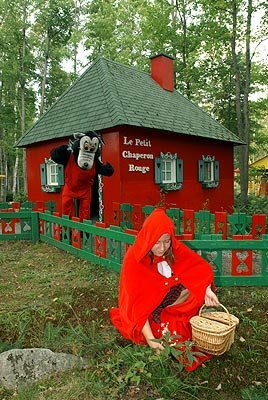 Helena has an affinity for the tale of Little Red Riding Hood (my mother will be pleased to know). So Wednesday we visited Little Red Riding Hood's grandmother's house twice. The wolf is tame now, though he a has a bright pink bandaid plastered across his nose where Red Riding Hood bopped him to put him back in his place. Helena tried unsuccessfully to make him talk, settled for a hug and a kiss and another hug. She'll be talking about this for months. Christopher Morley's Parnassus on Wheels is delightful — "graceful in style, light in substance, merry in its attitude toward life, and entertaining in every aspect of its plot and insight into character," to quote the Boston Evening Transcript as cited in the introduction to my 1955 edition. Written in 1917, its stylings and rhythms are of another era, and this only adds to its charm. I read it in just a couple sittings. It's definitely a feel-good book; I suspect I'll turn to it again next time I'm in bed with the flu. Has anybody not heard about this book? Just a few months ago it seemed to be on every blogger's lips. If you haven't read it — if you love books and have a soft spot for books about books — find it. One day, an adventure knocks on Helen McGill's farmhouse door — she buys a bookmobile from a strange little man, only to stop her brother, now a writer who's as good as abandoned the farm, from doing same. Having compiled an anthology of 6000 loaves of bread over the years, she's hankering after a few carefree days of her own, so she ups and leaves the farm to learn the itinerant bookseller's trade, and a little something about life and love. I began to see something of the little man's idealism in his work. He was a kind of travelling missionary in his way. A hefty talker, too. His eyes were twinkling now and I could see him warming up. "Lord!" he said, "when you sell a man a book you don't sell him just twelve ounces of paper and ink and glue — you sell him a whole new life. Love and friendship and humour and ships at sea by night — there's all heaven and earth in a book, a real book I mean. Jiminy! If I were the baker or the butcher or the broom huckster, people would run to the gate when I came by — just waiting for my stuff. And here I go loaded with everlasting salvation — yes, ma'am, salvation for their little, stunted minds — and it's hard to make 'em see it. That's what makes it worth while — I'm doing something that nobody else from Nazareth, Maine, to Walla Walla, Washington, has ever thought of. It's a new field, but by the bones of Whitman it's worth while. That's what this country needs — more books!" I'm pretty sure the bored, pudgy clerk behind the counter had no idea what he sold me. While I often crave and seek out the solace of a bookstore, I rarely find it, particularly since generally only big-box bookstores are within a comfortable walkable radius when that urge overcomes me — I leave them feeling unsatisfied and angsty; so I have over the years learned to subdue the urge, and my intuition is now better honed to knowing the right time and place for achieving bookstore zen. I browsed bookshops this morning, successfully — I came home with heavy bags (well, mostly owing to War and Peace, which foolishly I carried with me to read on the metro), but with a lightness in my step and in my soul. I went looking for one great underappreciated author in particular, but found works by others instead. I brought home Christopher Morley's Parnassus on Wheels (a 1955 edition in excellent condition with very funny "preliminary footnotage") and Lionel Shriver's We Need to Talk About Kevin (remaindered, cheap). (Also, Colson Whitehead's The Intuitionist, which appeals to my left brain.) Also found: Rebecca West's The Thinking Reed, not purchased, but of which I read the first chapter in-store; it leaves me with a niggling sensation — I must return for it. Sighted, on some book, the title of which I've conveniently forgotten, a blurb from Neil Gaiman stating that the author's "command of language borders on scary." Maybe I paraphrase a little, just a little, but really, Gaiman's command of language borders on scary. We had a spectacular, if relatively brief, thunderstorm yesterday evening, just around Helena's bedtime. We lost power, and seeing as she was already in bed and there was still enough light through the window by which to read her a story — and even though she sleeps with a light on in her room, I had a small battery-operated lamp at the ready — you'd think it wouldn't directly affect her routine, but it seems all the energy inpired by flashes of lightning and cracks of thunder necessitated extra-long stories and extra-long cuddling and hair-stroking before she would settle down to sleep (fiercely gripping my itty-bitty book light). She'd asked for, I don't know, something, and I explained that whatever it was wasn't possible cuz the lights had gone out, and she immediately jumped up to standing on her bed to look out the window and nodded, "Ah, oui," they're outside, I see the lights over there, which was confusing to me, then extremely funny, and I wonder, do all 3-year-olds do that? Or is it a function of her bilingualism — a little slower to understand an expression but perhaps paying more careful attention to it? Discussion opens today (we hope) on the first chunk of Tolstoy's War and Peace (as if anyone else ever wrote a book called "War and Peace"). One problem I'm stumbling over: it turns out I know nothing about the Napoleonic Wars. Rather, knew nothing. I know quite a bit now (at least, so far, about the rise of Napoleon's career to about 1805), not because Tolstoy has taught me anything but because I keep looking up information to feed my understanding of passing references. I'm assured that one doesn't need to know these things to appreciate the work as a whole, but I have trouble passing over the characters' comments, politely smiling and nodding, when the reference is not to something vague or wholly fictitious but is a matter of actual historical events and their consequent interpretation. Thus far, the references seem to add only a little to the character of Pierre. Pierre is a sympathizer (of Napoleon and the French Revolution), a Jacobin. He has the brashness of youth, a revolutionary spirit. Indeed, among aristocratic circles, he could be seen as if not a subversive then certainly an unpleasantness, a threat, at the very least a fool. Prince Andrei seems to like Pierre. We know Andrei to be smart and level-headed (though perhaps a little inconsiderate of his pregnant wife). Andrei strikes me as a good judge of character. The other problem that is a thorn in the forefront of my brain is that I read the introduction by John Bayley. (By the second page he is judging Middlemarch unfavourably: "George Eliot combined a power of intellect with a power of human sympathy, but she could not begin to render a common experience as Tolstoy did." I'm not sure I agree.) He begins by telling us there are more happy marriages in War and Peace than in any other novel. Well, I'm only on page 177, it's just 1805, but I've had insight into exactly one marriage (Andrei and Lisa) and it doesn't seem all happy to me. (The merest glimpse into the Rostov's life together is just that — a glimpse.) Other marriages loom on the horizon, but from where I stand they are rife with expectations and jealousies. None of this really matters, except for that I read the introduction and I wish I hadn't; it's planted an unwelcome (at this point) answer to the seed of the question of "what's this novel all about anyway?" I'm also realizing how very strongly the answer, for me, now, to that question is nourished by the other books I've recently read (specifically Miéville, also responsible for leading me to search out the historical reality behind Tolstoy's references). Anna Kavan — "She’s extraordinary. Powerful, disturbing, unconventional tales. One critic referred to her as "Kafka’s sister" and she’s worthy of the comparison." Adele Wiseman — "She took on topics thought at the time to be decidedly unsavoury for a woman writer... She is a daring, uncompromising, accomplished writer." Mesa Selimovic — "It's something of a feat to pull off nearly five hundred pages of a man thinking, without a great deal of action. So, I would say that it's subtlety and nuance that Selimovic is great for." Death and the Dervish. Denise Chavez — "Her stories are always filled with eccentric characters." Mary McCarthy — "She has this very honest, forthright voice that is devastatingly intelligent." Memoirs of a Catholic Girlhood. Also, great underappreciated book: U and I, by Nicholson Baker. Mark Alan Stamaty — "Full of fastidious, eccentric, hilarious, creepy, obsessive, possibly drug-addled detail, these books are surrealist classics." Who Needs Donuts? and Small in the Saddle. Rebecca West — "She's smart, versatile, and writes like a dream." Amin Maalouf — "Exotic locales, spiritual quests, stories within stories." Ursula K LeGuin — "She tends to approach many of her novels and stories from an anthropological viewpoint, dissecting and commenting on the societies and cultures she creates but that are ultimately reflections of our own in some way." Mary Wesley — "Wikipedia says it nicely: "Her take on life reveals a sharp and critical eye which neatly dissects the idiosyncrasies of middle-class England with humour, compassion and irony, detailing in particular sexual and emotional values."" Sebastien Japrisot — "He wrote a series of atmospheric noir thrillers." Lars Walker — "He is a good writer and I believe he has strong stories... It's good historical fantasy." Christopher Morley — "He has a keen eye for detail, a profound respect for books, and a wonderful sense of humor." Also, great underappreciated book: We Need to Talk About Kevin, by Lionel Shriver. Also, great underappreciated book: The Enormous Room, by ee cummings. I've heard of some of these authors,in passing, mainly on the blogs of those people who put the names forth, but on the whole they are new to me and wonderful discoveries. Other names I know quite well, but are typically circumscribed by some genre or other label: "underappreciated" is a subjective judgement. I'm determined to hunt down some work by Anna Kavan (particularly Ice), since earlier this year I read a short essay (by Doris Lessing, in Time Bites) summing up three of her books. The Underrated Writers Project thread is still open at MetaxuCafé — nominate your own favourite underappreciated writer. See the Introduction and the list of 55 writers compiled at Syntax of Things. On a relatively quiet holiday Monday, we headed out to pursue our jazz education. 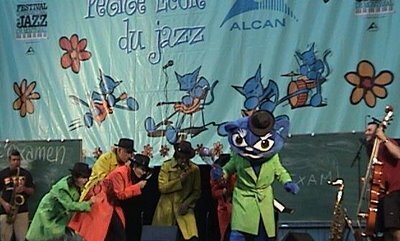 La Petite Ecole du Jazz was specifically geared toward youngsters, most of whom were likely the less than willing accompaniments to afficionado parents, out-of-towners on jazz-vacation weekends. It was that vaguely pleasant time of morning when the kids are starting to tucker from hours of play and the parents are just beginning to reap the benefits of copious pots of coffee. The crowd was remarkably well-behaved, I'd even say mellow. Audience members sang out nursery rhymes and other childhood favourites; the band echoed them jazz-style, swing or latin or blues. Lessons included cool vs not-cool as exemplified through syncopated hand-clapping rhythms, what is jazz vs not-jazz, counting (Take Five!). The band did some fun tricks like playing blindfolded and playing (piano) upside down. And of course, the jazz festival mascot, Ste-Cat, was a big hit. Helena was tired, but she impressed me with spontaneous bursts of head-bopping, hip-swaying, foot-tapping. She passed with flying colours, and we have the certificate to prove it. No one seemed disposed to contradict him because Wong had quietly appeared with the coffee and Ronald, shrugging his shoulders, had turned loose Fred Waring and his Pennsylvanians and after a terrible scratching they reached the theme that fascinated Oliveira, an anonymous trumpet followed by the piano, all wrapped up in the smoke of an old phonograph and a bad recording, of a corny prejazz band, all in all like those old records, showboats, Storyville nights, where the old only really universal music of the century had come from, something that brought people closer together and in a better way than Esperanto, UNESCO, or airlines, a music which was primitive enough to have gained such universality and good enough to make its own history, with schisms, abdications, and heresies, its Charleston, its Black Bottom, its Shimmy, its Fox Trot, its Stomp, its Blues, to label its forms, this style and the other one, swing, bebop, cool, a counterpoint of romanticism and classicism, hot and intellectual jazz, human music, music with a history in contrast to stupid animal dance music, the polka, the waltz, the zamba, a music that could be known and liked in Copenhagen as well as in Mendoza or Capetown, a music that brings adolescents together, with records under their arms, that gives them names and melodies to use as passwords so they can know each other and become intimate and feel less lonely surrounded by bosses, families, and bitter love affairs, a music that accepts all imagination and tastes, a collection of instrumental 78's with Freddie Keppard or Bunk Johnson, the reactionary cult of Dixieland, and academic specialization in Bix Beiderbecke, or in the adventures of Thelonious Monk, Horace Silver, or Thad Jones, the vulgarities of Erroll Garner or Art Tatum, repentance and rejection, a preference for small groups, mysterious recordings with false names and strange titles and labels made up on the spur of the moment, and that whole freemasonry of Saturday nights in a student's room or in some basement café with girls who would rather dance to Stardust or When Your Man Is Going to Put You Down, and have a sweet slow smell of perfume and skin and heat, and let themselves be kissed when the hour is late and somebody has put on The Blues with a Feeling and hardly anybody is really dancing, just standing up together, swaying back and forth, and everything is hazy and dirty and lowdown and every man is in a mood to tear off those warm girdles as his hands go stroking shoulders and the girls have their mouths half-opened and turn themselves over to delightful fear and the night, while a trumpet comes on to possess them in the name of all men, taking them with a single hot phrase that drops them like a cut flower into the arms of their partners, and there comes a motionless race, a jump up into the night air, over the city, until a miniature piano brings them to again, exhausted, reconciled, and still virgins until next Saturday, all of this from a kind of music that horrifies solid citizens who think that nothing is true unless there are programs and ushers, and that's the way things are and jazz is like a bird who migrates or emigrates or immigrates or transmigrates, roadblock jumper, smuggler, something that runs and mixes in and tonight in Vienna Ella Fitzgerald is singing while in Paris Kenny Clarke is helping open a new cave and in Perpignan Oscar Peterson's fingers are dancing around and Satchmo, everywhere, with that gift of omnipresence given him by the Lord, in Birmingham, in Warsaw, in Milan, in Buenos Aires, in Geneva, in the whole world, is inevitable, is rain and bread and salt, something completely beyond national ritual, sacred traditions, language and folklore: a cloud without frontiers, a spy of air and water, an archetypal form, something from before, from below, that brings Mexicans together with Norwegians and Russians and Spaniards, brings them back into that obscure and forgotten central flame, clumsily and badly and precariously he delivers them back to a betrayed origin, he shows them that perhaps there have been other paths and that the one they took was maybe not the only one or the best one, or that perhaps there have been other paths and that the one they took was the best, but that perhaps there were other paths that made for softer walking and that they had not taken those, or that they only took them in a halfway sort of way, and that a man is always more than a man and always less than a man, more than a man because he has in himself all that jazz suggests and lies in wait for and even anticipates, and less than a man because he has made an aesthetic and sterile game out this liberty, a chessboard where one must be bishop or knight, a definition of liberty which is taught in school, in the very schools where the pupils are never taught ragtime rhythm or the first notes of the blues, and so forth and so on. – From Hopscotch, Julio Cortazar, 1963.